John Robertson hopes Hearts’ loss will prove to be Caley Thistle’s gain when midfielder Angus Beith gets up and running with the Highlanders. Beith signed a three-year deal with Inverness this summer after his Tynecastle contract expired following loan spells with Stirling Albion, Stenhousemuir and Stranraer. The 22-year-old is recovering from a hip injury and will not feature in either of Caley Jags’ matches this afternoon, with Inverness fielding two separate teams for the games against Keith at Kynoch Park and Strathspey Thistle at their Fort George training ground. Beith made just three first-team appearances for the Jambos and Robertson reckons the Edinburgh-born midfielder was unfortunate not to have been given more of an opportunity with his hometown club. Robertson said: “Angus Beith is one who has slipped through the net at Hearts. He was out on loan and won young player of the year at Stirling Albion. He was terrific last year for Stranraer. He’s been unlucky in that, while he’s been out on loan, other lads have come into the Hearts team like Harry Cochrane and Anthony McDonald. 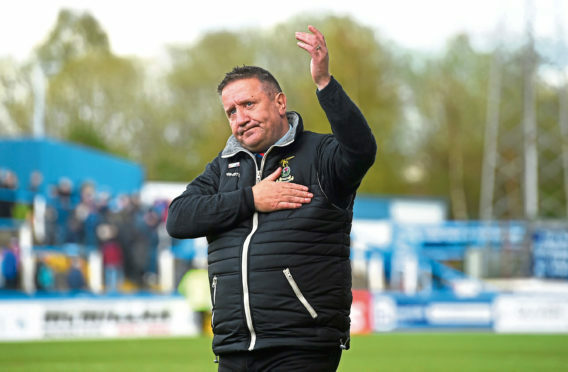 Robertson is looking forward to his players’ return to action this afternoon as he looks to build up his squad’s fitness for the start of the Betfred Cup campaign at home to Cove Rangers on July 14. He added: “We are now entering the second phase. There is a physical fitness, which the players have completed now, and there is now a technical fitness – getting their touch back, passing, control and clipping long and short balls.